Take the math out of half-square triangles (adding 7/8in tothe finished size of half-square triangles). 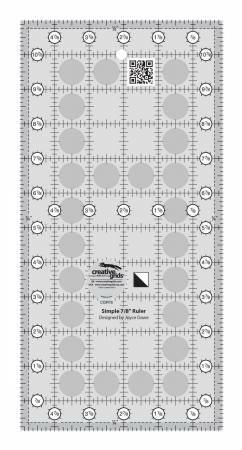 Solid blacklines are marked at 7/8in, 1-7/8in, 2-7/8in, 3-7/8in,4-7/8in and 5-7/8in for easy cutting of units. Exclusiveline. Independents only. Made in the USA.